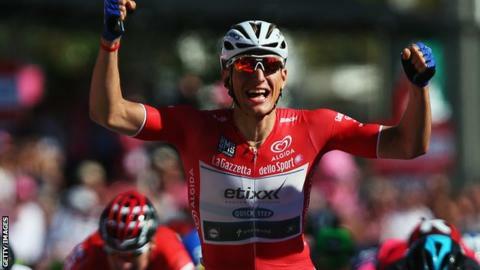 Germany's Marcel Kittel has claimed the leader's pink jersey in the Giro d'Italia with victory in the third stage in Arnhem. The Etixx-Quick Step rider followed up Saturday's stage win with another imperious display to power home in a sprint finish. Kittel won by three bike lengths from Team Sky's Elia Viviani and fellow Italian Giacomo Nizzolo (Trek). Overnight leader Tom Dumoulin (Giant-Alpecin) is second, nine seconds down. Kittel has now won all four Giro d'Italia road stages he has completed and has 13 Grand Tour stage victories to his name. He told Eurosport: "It was a super tough day with cross winds making the riders nervous to stay in position and then a breakaway that stayed out in front for some time. "We had to go full gas. My team-mates did an amazing job to get me to the front at the right moment and give me the best possibilities to start the sprint." For the second year in a row, there are no British riders competing in the race. Monday is a rest day as the tour leaves the Netherlands and heads to Italy for stage four, a 191km mountain stage between Catanzaro and Praia a Mare. 2. Tom Dumoulin (Ned/Giant) +9"
3. Andrey Amador (Crc/Movistar) +15"
4. Tobias Ludvigsson (Swe/Giant) +17"
5. Moreno Moser (Ita/Cannondale) +21"